UEFI: The acronym stands for Unified Extensible Firmware Interface and is designed to be more flexible than its venerable predecessor. 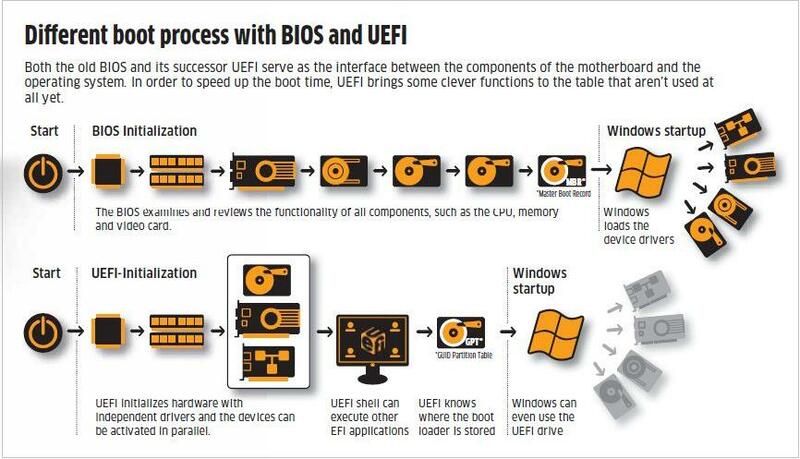 Wave goodbye to BIOS, say hello to UEFI, a new technology that will drastically reduce start-up times. The next generation of home computers will be able to boot up in just a few seconds, as 25-year-old BIOS technology makes way for new start-up software known as UEFI. BIOS technology, which has been used to boot up computers since 1979, was never designed to last as long as it has, and is one of the reasons modern computers take so long to get up and running. By contrast, UEFI – which stands for Unified Extensible Firmware Interface – has been built to meet modern computing needs, and will soon be the pre-eminent technology in many new computers, enabling them to go from ‘off’ to ‘on’ in seconds. Pronounced “bye-ose,” BIOS is an acronym for basic input/output system. 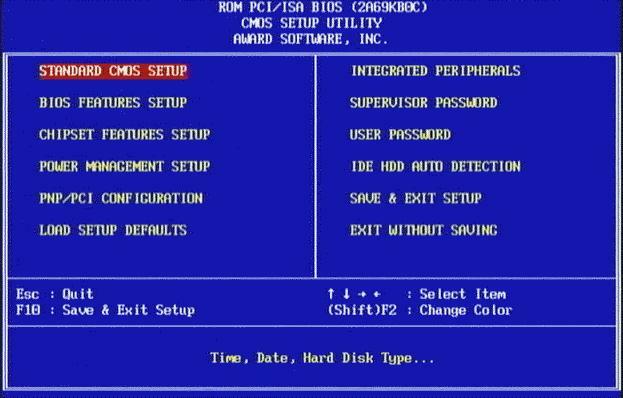 The BIOS is built-in software that determines what a computer can do without accessing programs from a disk. On PCs, the BIOS contains all the code required to control the keyboard, display screen, disk drives, serial communications, and a number of miscellaneous functions. The BIOS is typically placed on a ROM chip that comes with the computer (it is often called a ROM BIOS). This ensures that the BIOS will always be available and will not be damaged by disk failures. It also makes it possible for a computer to boot itself. The CPU “wakes up” (has power) and reads the x86 code in the BIOS chip. 5. After being loaded into memory, the boot program then loads the system configuration information (contained in the registry in a Windows environment) and device drivers. 6. Finally, the operating system is loaded, and, if this is a Windows environment, the programs in the Start Up folder are executed. The BIOS has two fundamental weaknesses. Firstly, it is based on 16-bit assembly code and cannot directly address the latest 64-bit hardware, and secondly, there are no set standards for specifications, so manufacturers come up with their own versions. The participants of the UEFI Forum wanted to set this straight. From the outset, each process has been precisely defined. Thus, the boot process or platform initialization (PI) is clearly described in phases. Immediately after powering up the PC, the Pre-EFI Initialization (PEI) is executed, which initializes the CPU, memory and chipset. This is then followed by the Driver Execution Environment (DXE). At this point, the rest of the hardware is initialized. This process saves the time required for booting because UEFI can integrate various drivers that need not be reloaded during booting. Thanks to these drivers, the user already has access to network card, including features such as network booting and remote assistance at the early stage of the boot process. With the graphics processor enabled, a fancy user interface is also presented. However, biggest time-saving feature of UEFI is the fact that not all the installed hard drives will be scanned for the boot loader, since the boot drive is set during the installation of the operating system in the UEFI. The default boot loader is run without consuming much time searching the drives. The faster boot time is not the only advantage of UEFI; applications can be stored on virtually any non-volatile storage device installed on the PC. For example, programs and diagnostic tools such as antivirus or system management tools can be run from an EFI partition on the hard drive. This feature will be very useful to original equipment manufacturers (OEM), who can distribute systems with extra functions in addition to the standard EFI firmware stored on the motherboard’s ROM. 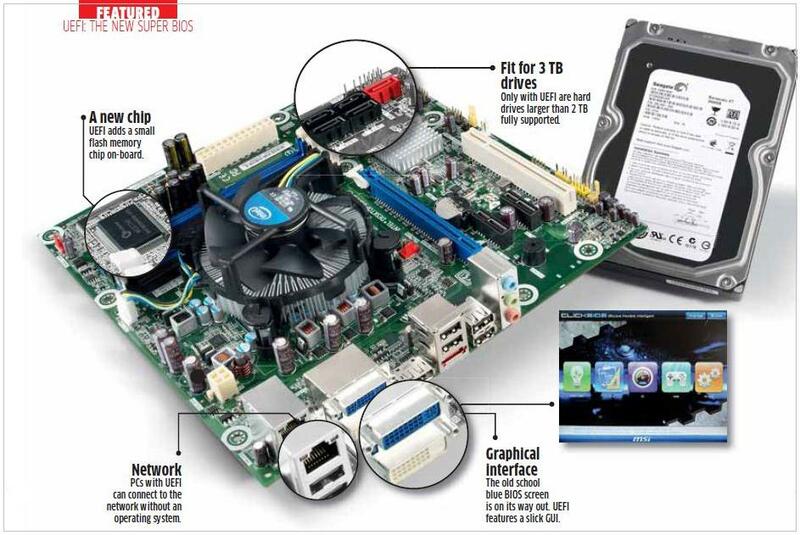 The classic BIOS can access only up to 232 sectors of 512 bytes in size, which translates to a total of 2 TB. So the upcoming 3 TB variants of Western Digital Caviar Green and Seagate Barracuda XT won’t be fully compatible with the current BIOS. Seagate uses larger sectors to make the full capacity usable on Windows, but the BIOS cannot boot from this drive. UEFI, on the other hand, works with GUID partition table (GPT) with 64-bit long addresses and can handle up to 264 sectors that address up to 9 Zettabyte (1 zettabyte equals 1 billion terabytes). GPT disks can grow to a very large size. The number of partitions on a GPT disk is not constrained by temporary schemes such as container partitions as defined by the MBR Extended Boot Record (EBR). The GPT disk partition format is well defined and fully self-identifying. Data critical to platform operation is located in partitions and not in unpartitioned or “hidden” sectors. GPT disks use primary and backup partition tables for redundancy and CRC32 fields for improved partition data structure integrity. The GPT partition format uses version number and size fields for future expansion. Each GPT partition has a unique identification GUID and a partition content type, so no coordination is necessary to prevent partition identifier collision. Each GPT partition has a 36-character Unicode name. This means that any software can present a human-readable name for the partition without any additional understanding of the partition.